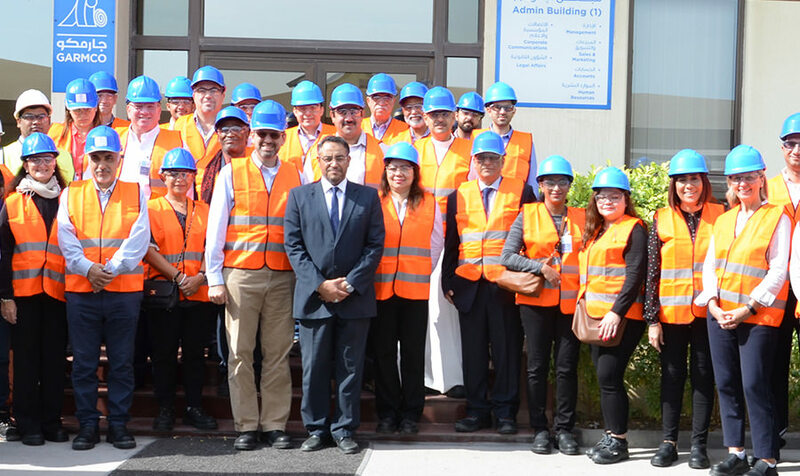 The American Chamber of Commerce in Bahrain (AmCham Bahrain) members were hosted for a tour of the Gulf Aluminum Rolling Mill Company (GARMCO) plant in northern Sitra. Mr. Mohamed Essa Ebrahim, GARMCO Acting Chief Executive Officer, provided an overview of GARMCO, its growth, future plans, and how the U.S.-Bahrain Free Trade Agreement (FTA) opened the U.S. market. Mr. Ebrahim stated “GARMCO is pleased to showcase our plant and its contribution to Bahrain’s economy and US-Bahrain bilateral trade. Our new soon to be fully operational re-melt plant will increase our production while saving us energy and resources.” Mr. Ebrahim continued “The U.S. is an important market for GARMCO and we are pleased to have AmCham members representing a wide range of sectors with us today to learn about Bahrain’s aluminum industry and GARMCO’s very successful FTA story. The U.S. is GARMCO’s largest export market outside of the MENA region, currently receiving about 40% of GARMCO’s manufactured products. GARMCO strategically locates stocks of core products from the Bahrain mills in Baltimore Maryland, Houston Texas, and Long Beach California, facilitating convenient just-in-time delivery to customers. For innovation, GARMCO partners with a U.S. university for research and development. Aluminum is the top export from Bahrain to the U.S. In 2016, $406M worth of aluminum was exported to the U.S., up from $293M in 2015. GARMCO’s rolled aluminum coils are a significant part of this increasing and important export.